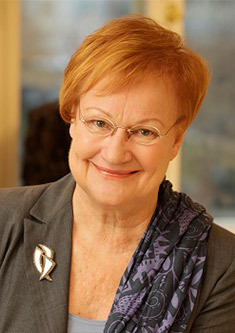 Ms. Halonen was President of Finland from 2000 to 2012, the first woman to hold the post. Her successful political career – she was both Minister of Foreign Affairs (1995-2000) and Minister of Justice (1990-1991) before becoming President – followed her early experience as a trade union lawyer and was characterised by her dedication to human rights and challenges related to globalisation. Ms. Halonen is a member of the Council of Women World Leaders, a network of current and former women prime ministers and presidents whose primary goal is to draw on the experience of its members to support women’s full participation and representation in the political process at the highest levels.